Despite having three previous albums to her credit, including one with Gudrun Gut, this is my first encounter with Canadian spoken word artist Myra Davies. I sometimes wonder, as an occasional spoken – or shouted – word performer myself why there aren’t more talkers putting out spoken word recordings. As a medium, spoken word is enjoying a surge in popularity, with both open mic and curated spoken word nights springing up all over, in addition to those longstanding ones which have survived, sometimes by virtue of being the only platform around for a form of entertainment which is, one could argue, the oldest of all. There are a fair few big name authors who have extensive catalogues – Charles Bukowski, William Burroughs, Henry Rollins are among the first names which spring to mind – but apart from the odd clip on YouTube, it seems that very few writers who read aloud commit their voices to the recorded medium. Granted, some writers simply aren’t cut out to perform, and sadly, their readings to their material a disservice. But then, when done well, performance can bring a piece of writing to life and convey elements of the work not always immediately apparent to a reader. It’s all about the emphasis, the intonation. And there’s nothing to say spoken word recordings have to replicate the experience of those readings which take place in pubs and libraries: there is infinite scope to render the words very differently and to add myriad depths and dimensions – as Joe Hakim’s collaboration with Ashley Reaks and the recent album by The Eagertongue evidence – when done well, spoken word can be exciting and can reconfigure whatever perceptions one may have of the genre – which, of course, isn’t really a genre. Because spoken word can spill into so many other fields, and far beyond rap at that. Kate Tempest? C’mon, please! Her accessible, right-on doggerel may be well-meaning, but it’s little more than sixth-form poetry delivered in a hip-hop style without the beats. 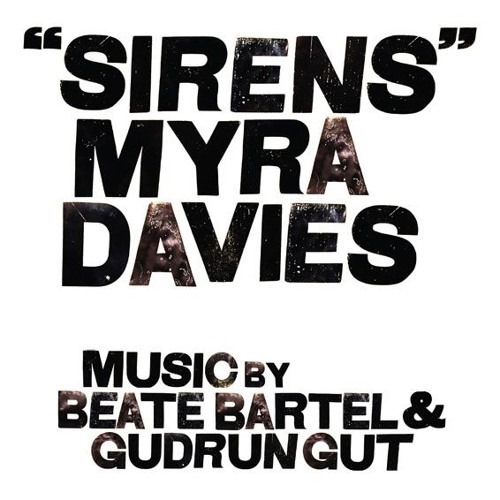 On Sirens, Myra Davies brings the beats, thanks to her two musical collaborators, Beate Bartel and Gudrun Gut, who provide the backing to alternate tracks Despite this, Sirens demonstrates a remarkable cohesion, and doesn’t flip-flop between styles. Davies is a fantastic orator: she’s not only blessed with a cool, laconic tone, which benefits from her dry Canadian accent, but she’s also got a real sense of what works for narrating her own words. Sounds simple, but many writers lack this skill. ‘Armand Monroe’ sets the tone: sparse, angular, electropop with a funk groove, it’s cold yet fiery, as Davies spins out a succession of evocative imags. Jittery, tense robotix with propulsive, grinding synths abound, and wibbly loops and sumptuously spacey motoric beats dominate the album. ‘Golddress’ is a taut effort: listening through ‘phones, I find I have a racing pulse and my sense of anxiety increases as the track builds: it’s steely, detached tone is curiously out of kilter with real time and current space, it’s hard to let it simply pass. Instead of sounding like a retro hash of futuristic music from the 80s – to which it does bear clear parallels – Sirens captures a sense of alienation, of otherness. It’s not simply in the weird doubling and echo-based effects on the vocals, or the treatments of the drums, or the twitchy, slowly warping effects of the synth backings – all of which contribute to Sirens being far more than a ‘spoken word’ album – but a combination of all of these factors, with the addition of something intangible. Perhaps it’s simply the restrained force and clinical focus of Davies’ delivery of words which are both gritty and discomforting. Ultimately, it comes down to the fact that Sirens is a superlative work of art. A hybrid of spoken word and electro-pop / coldwave / etc., it represents a perfect creative synthesis.